Sanand (Gujarat): Along a dusty, traffic-choked road in the Gujarat lies what may be India’s industrial future. As labourers work under a blazing sun to widen the highway, auto giants Ford Motor Co and PSA Peugeot Citroen prepare to spend nearly $2 billion to build new plants in Sanand, a sparsely populated collection of villages about 40 kilometres west of Ahmedabad. 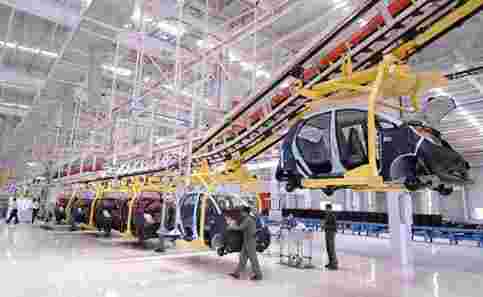 More automakers and suppliers are expected to follow, taking advantage of the state’s business-friendly policies, including comparatively little bureaucratic red tape and, crucially in crowded India, ease of acquiring land. “You have a pro-business environment from the Gujarat government focused on getting companies like us to come in," said Michael Boneham, who heads the Indian operations for Ford, which will open its plant in Sanand in 2014. The Indian auto industry, which grew 30% last fiscal year before a recent slowdown, is a key growth engine for India’s underdeveloped industrial sector. New Delhi wants to lift manufacturing’s share of the economy to 25% over the next decade from about 16% now, a daunting target. While car sales have skidded in recent months on rising interest rates and prices, the industry is expected to grow 10-12% for the year ending March 2012. The longer-term potential is vast in a country that sold 1.9 million cars in its last fiscal year. China sells that many in seven weeks. By rolling out the red carpet to manufacturers, Gujarat is taking on existing Indian auto hubs, including the southern city of Chennai, known as “India’s Detroit." Executives and investors hope the competition between states ultimately results in improved business conditions across India. “When more states compete for investments, then more states will become states where people want to go. This is a good thing," said R.C. Bhargava, chairman of Maruti Suzuki, India’s dominant carmaker. Maruti, which is 54% owned by Japan’s Suzuki Motor and has been plagued by labour trouble at its plant near New Delhi, will decide by the end of October where to build its next factory and is widely reported to be leaning towards Gujarat for a plant with capacity of one million cars a year. Under high-profile but divisive chief minister Narendra Modi, Gujarat stands apart in a country that doesn’t always make it easy for manufacturers. Home to the world’s biggest oil refinery, Gujarat accounts for 22% of India’s total exports, according to KPMG, even though it is home to just 5% of the population. Gujarat’s economy grew by 13.8% annually in the five fiscal years through March 2010, far in excess of the national average of 8.6% over the same period. Modi, a member of the Bharatiya Janata Party (BJP), has leveraged the economic success of his state to become a national leader and potential prime ministerial candidate. The 61-year-old Modi, who wears a trimmed white beard, recently held a widely-publicized fast to improve his image. Gujarat, the birthplace of Gandhi, is known for its abstemious people where most residents are vegetarians and the sale of alcohol to locals is banned. The state’s charms for manufacturers include plentiful electricity and skilled labour. “The biggest challenge for OEMs (original equipment manufacturers), especially automakers, is the availability of infrastructure such as power, roads, ports, rail," said Abdul Majeed J. Shaikh, who heads the automotive practice at PriceWaterhouseCoopers in India. “From that perspective, Gujarat over a period of the last three to five years has started using infrastructure as a key thing to attract investors," he said. An official with the state of Tamil Nadu, home to Chennai, points out that the city has India’s largest component supplier base and three sea ports. He said Chennai continues to attract automotive investment and will remain India’s car-making hub. “There is already a very healthy competition. But healthy competition can become unhealthy also, because some state may get desperate for investments and offer undue incentives," said M. Velmurugan, executive vice chairman of the Tamil Nadu Industrial Guidance & Export Promotion Bureau. “Many of our companies are being chased at, but even then we are getting substantial investments," he said, without singling out a specific state. Sanand was put on the map in 2008 when Tata Motors shifted production of its Nano, the world’s cheapest car, from West Bengal, where it was driven away by violent protest from farmers. While Tata’s Nano has not lived up to the hype that accompanied its roll-out, posting sluggish sales, it has proven a trend-setter in an industry where there are benefits for rival manufacturers and suppliers to cluster together. As part of an industrial policy introduced in 2009, Gujarat uses a programme called “Assistance to Mega and Innovative Projects" that includes financial aid, road links, and help in setting up ancillary units, which is important for car manufacturers that rely heavily on suppliers. At the “Vibrant Gujarat" event in January, investments totalling Rs21 trillion ($428 billion) were announced, although it is impossible to know how much of that will actually be spent. High-profile executives including Tata group chairman Ratan Tata spoke in praise of Modi and the state at the event. Besides the Ford and Peugeot plants, which were announced in recent months, officials have set aside land for their suppliers. “When you have significant volume from number of players, whether they are global or local, you get the supply base to come to you. No point setting up a factory if your supply base doesn’t come close to you because of incoming logistics costs," said Ford’s Boneham. Ford’s Sanand facility will be in addition to its existing plant in Chennai. South Korea’s Hyundai Motor, India’s No.2 player by market share, also makes cars in Chennai. “Part of it is also a well-educated workforce, that we can train and develop in the automotive game," said Boneham, who said Ford chose Gujarat in part to put it closer to the western and northern India markets, where 60% of cars are sold. Perhaps most important for industry, Gujarat offers vast holdings of government-owned land, removing a key hurdle that plagues big projects elsewhere in densely-populated India. Tata’s car plant stands beyond rows of Nano cars, which cost $2,880 for a basic model sold in Delhi. The land was originally owned by the Gujarat government, saving Tata the hassle of assembling the site on its own. The state bought land from villagers to build the road to the plant. Gujarat pays villagers what it considers to be a generous price, determined by a third party. “Then we give them 10% of the differential price if we sell the land at a higher price, and on top of that, we pay them 750 days on minimum wages if they lose all their land in our acquisition," said a senior official at Gujarat’s main industry body, who declined to be identified. Residents of Sanand, which is made up of 67 villages housing fewer than 200,000 people, are divided on what the oncoming industrial juggernaut means to them. Kamal Khan, who earned Rs6,000 a month as head watchman at the farmland later awarded to Tata, has not seen any improvement in his lot and now earns less than that running a tea stall that sells to truck drivers. “Only a handful of people, who were almost like beggars, became millionaires overnight. What did we get? Nothing." But another villager who did well on the deal disagreed. “It makes so much sense for anyone to sell the land the government wants at a very high price and buy low-priced land elsewhere. Productivity is the same everywhere in this area," said Chandrakant Patel, 34, who sold three bighas (nearly two acres) of farmland for Rs2.8 million ($57,270) each. “I bought seven bighas of land for Rs600,000 each, bought a tractor, and now my production just zoomed up. I also bought a car and still I have a huge bank balance," Patel said.